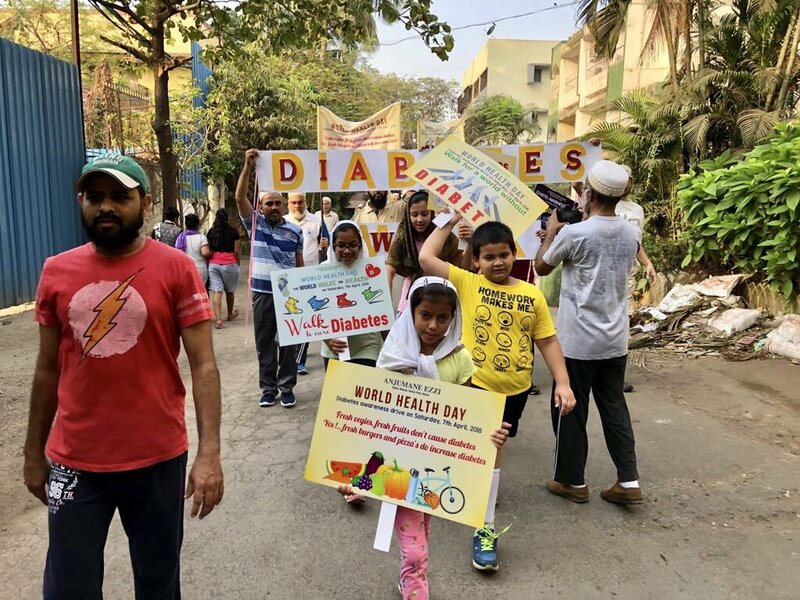 As part of this year’s World Health Day 2018 theme of ‘Universal Health Coverage: Everyone, Everywhere’, Dawoodi Bohra community members in collaboration with the local jamaats and medical centres organised numerous health programmes including free medical camps and diabetes awareness walks to promote healthy living. These programmes attracted widespread support from men, women and children of various ages and faiths while providing a platform to educate local communities on the importance of staying healthy. In order to emphasise the benefits of walking in reducing the risk of lifestyle diseases like diabetes and obesity, Anjuman-e-Ezzi organised a diabetes walk and physical activity programme on 7th April at Saifee Park, Marol. The 3 km walk which commenced at 6 am from the Saifee Masjid passed through Shanti Sandesh garden before finishing at the Hasanat High School playground. The walk was followed by brisk walking competition for seniors, and friendly matches of volleyball, throwball and badminton. “Despite being a weekend, we were pleased by the turnout, especially the enthusiasm with which a large number of children participated in this day-long programme,” said Aliasgar Calcuttawala who was one of the organisers. “Taking a leaf out of this event, we hope to undertake many such programmes to create a culture where physical activity and healthy eating is a part of our daily lives”, he added. The participants carried banners and placards highlighting messages regarding the importance of walking to combat diabetes. 8-year-old Yusuf Savai who carried the message “Walk for a World without Diabetes” said that he took part in the walk because he wanted people to know that even brisk walking and simple lifestyle changes could help prevent many diseases. A few days ago, Dawoodi Bohra community members in Leicester, UK associated with health campaigners and supporters in organising a charity walk in Victoria Park to increase awareness and educate people about diabetes. The walk was supported by City Mayor, Sir Peter Soulsby, MP, Keith Vaz, Leicester City Council and Leicestershire Police Chief Constable Simon Cole. Walkers from across the city and county turned out in large numbers to join the charity and support the ‘Walk for Diabetes’ cause. A number of locals in the bustling city of Karachi benefited from the free medical and blood donation camps organized by Burhani Ambulance Corps on World Health Day weekend (7th and 8th of April) at various places in the city. The teams of specialized doctors including cardiologists, dermatologists and gynaecologists as well as orthopedic surgeons, eye surgeons and other general surgeons provided free diagnostic and treatment to patients. In Indore, for instance, community members and Saifee Ambulance Corp organised a special Cancer detection camp on 8th of April. The camp was inaugurated by the Chairman of Indore Development Authority, Shankar Lalwani alongside Indore Deputy Inspector General, Harinarayanachari Mishra, and senior doctors from Indore Cancer Foundation Charitable Trust. At the event, the Dawoodi Bohra jamaat of Indore also presented a donation cheque on behalf of His Holiness Dr Syedna Mufaddal Saifuddin TUS to Indore Cancer Foundation. “We are grateful to Syedna for supporting the trust and blessing us to continue with our endeavour in fighting this deadly disease especially among less privileged communities in the country,” shared Dr Digpal Dharkar, Chairman of Indore Cancer Foundation. Recently community members had also organised a free health checkup camp titled ‘Project Good Health’ in Cuttack, Odisha. Thousands benefited from this camp which not only sought to provide free medical treatment but also create a dialogue about healthy living among the local communities.